16,115 valuable elements of nature on the Slovenian territory have been given the status of ‘valuable natural feature,’ 10,725 of which are subterranean caves. Developments and activities on valuable natural features may only be carried out in the absence of other spatial or technical possibilities. This indicator shows the occurrence of individual types of valuable natural features and the protection regime for entering karst caves. Valuable natural features of national importance comprise features that are of international or great national importance and which are under the jurisdiction of the state. Others are of local importance and are protected by the local communities. All valuable natural features within protected areas established by the state are of national importance. Features of national importance also include all subterranean caves, which have been given the status of geomorphologically valuable natural features. Pursuant to a regulation governing subterranean caves, every cave has been placed under one of three protection regimes as regards access. Accordingly, caves are divided into closed caves, where the natural cave environment is vulnerable to such a degree that it could be damaged or threatened by any entry of humans into the cave, open caves with supervised access, where the natural environment is vulnerable to such a degree that it could be damaged or threatened by any unsupervised entry of humans, and open caves that can be visited without limitations and cannot be damaged as long as the general protection regime is observed. 16,115 valuable elements of nature have been given the status of valuable natural feature, of which 5,390 are valuable natural features and 10,725 are subterranean caves. 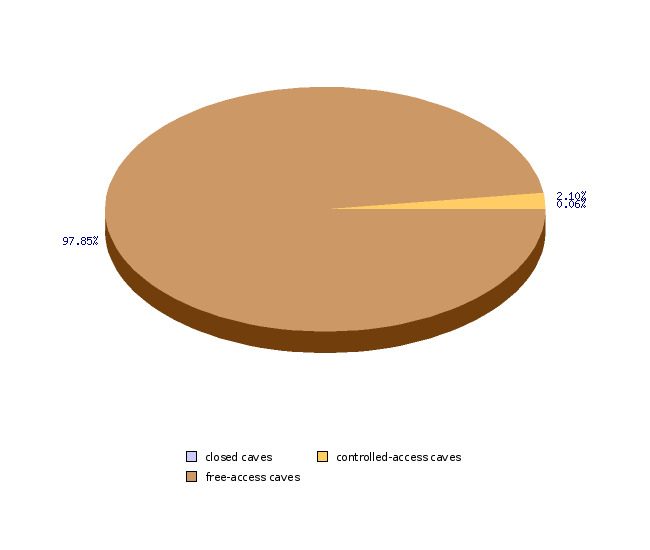 All subterranean caves are of national importance, while 1,996 (37.03%) of the other valuable natural features are of national importance and 3,394 (62.97%) are of local importance. In order to ensure uniform management, all valuable natural features established by the state are of national importance, regardless of the scientific criteria. The density of valuable natural features for the entire country is 0.29 per square kilometre or one valuable natural feature per 3.23 square kilometres. 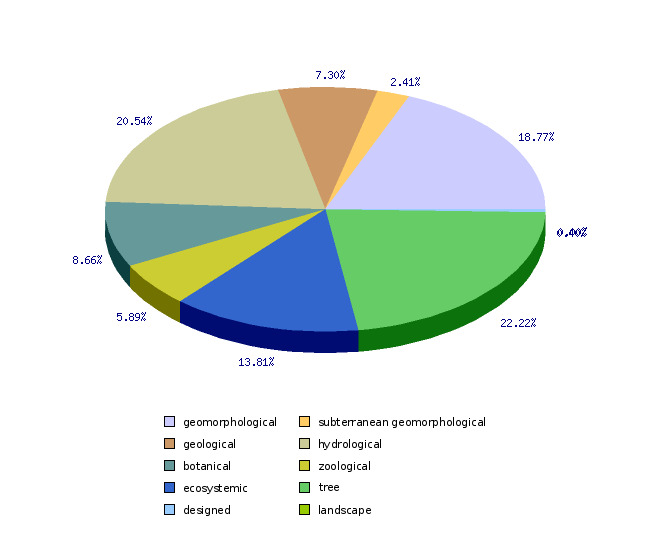 2,735 valuable natural features (56.6%) are spatially presented as points, while 2,831 (43.4%) features are presented as identification reference points as well as polygons delineating the area of valuable natural features. The total surface area of all polygons amounts to 2,467.00 km2 or 12.17% of the country's territory. Polygons are predominantly small in size, as only 345 are larger than 1 km2. In terms of the surface area, the largest geomorphologically valuable natural features are the Pokljuka and Jelovica Plateaus, followed by overthrust structures of the Nanos Plateau and the Karst edge. In April 2015, the Rules amending the Rules on the designation and protection of valuable natural features gave 10,725 caves the status of subterranean geomorphologically valuable natural features of national importance. This means that the density of caves that are valuable natural features is 0.529 per square kilometre or one cave per 1.890 square kilometres. Ideally, all 230 closed and supervised-access caves would have a gate at the entrance, which, coupled with stewardship, would ensure actual control over the caves. 83 caves are currently equipped with gates and 22 caves are defined as tourist caves. There are also 88 caves recorded as burial places. Even though no systematically gathered data concerning the pollution of caves for all of Slovenia are at hand, it can be estimated on the basis of available data that 15-20% caves in lowland karst areas are polluted. Activities and developments affecting valuable natural features are permitted only where there are no other spatial and technical possibilities. Even in such events, they must be carried out in such a manner that the valuable natural feature is not destroyed and the characteristics it has that lead to it being designated as a valuable natural feature are not changed. As a rule, the existing use of a valuable natural feature should be maintained, while using it in a sustainable or environmentally-friendly way that does not threaten or hinder its protection is also permitted. A valuable natural feature and its immediate vicinity may be developed in accordance with a prescribed procedure for the purposes of public display by setting up trails, lookout points, resting places, protective fences, information boards, warnings, etc. Valuable natural features of national or local importance may be additionally protected by the state or local community through protection measures specified by the Nature Conservation Act (contractual protection, stewardship, temporary or permanent protection and restoration).